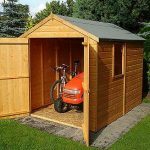 This 6′ x 4′ pressure treated overlap security shed by Shed-Plus is a great addition to any garden, offering a significant storage facility with a traditional style, and all at a very affordable price. Security has been a key consideration in the manufacture of this shed, and it shows. We were impressed by how tough and durable the shed is, and because it has a completely windowless design you won’t have to worry about prying eyes seeing what you’re storing within it. Both the apex roof design, featuring durable roofing felt, and the overlap cladding on the body of the shed help to repel rain and stop the ingress of water into the shed itself. This means that even in the worst of our weather conditions, you won’t have to worry about keeping your tools and garden equipment dry. 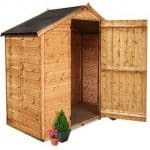 With the advantage of a very generous 15 year manufacturer’s guarantee, you’ll get peace of mind for the shed itself as well as for the contents within it. We found that this shed has a build quality which belies its price tag, offering toughness and design that you’d expect to find on much more expensive sheds, and there are also a range of optional extras available such as the all important base kit to offer extra protection to the timber. We like the traditional look of this security shed, which means that it will look unobtrusive in any garden. Indeed, when painted or stained it can become an attractive garden feature in its own right, and not just a place to store your valuable garden equipment and tools. The overlap design of the cladding is a real classic, as it is simple to manufacture and construct, thereby keeping costs down for the consumer, as well as creating a surface that rain will simply bounce off. We also found that the apex design of the roof increases the head room once inside, making it a much more comfortable environment to spend time in. The roof height at its maximum is 2.01m with an eaves height of 1.65m. It has a width of 1.33m with a depth of 1.84m, both of these including the overhang. The door is 1.62m high and 0.66m wide which is easily enough to get a lawnmower or wheelbarrow in and out. We find that a lot of sheds in this price range feature overlap cladding, as it combines effective weather protection and affordable materials, but it’s important that the cladding used is thick enough for the everyday wear and tear a shed can expect to be subjected to. That’s why we were impressed by the 8mm thickness of the cladding used by Shed-Plus, it feels tough and well constructed so should withstand knocks and bangs. As you’d expect for a shed costing less than £200, it features a standard frame type, but what you may not expect is for it to have a solid sheet material floor. This is a durable flooring substrate which felt firm and solid under our feet, and so you want have to worry about storing large or heavy equipment upon the floor. It’s important, however, that the shed is constructed on a solid and firm foundation, so we recommend the purchase and use of a shed base kit. When you buy a garden shed you want it to last, especially when it’s being used to store valuable items. In our damp and unpredictable climate untreated wood can quickly become damaged or rotten, and this makes it more vulnerable to thieves. That’s why it’s so important that a shed is treated and protected from its very first day, and that’s exactly what Shed-Plus deliver. When we first saw this shed we noticed the green tinge to the timber, which was itself a reassurance as this is an indicator of the tanalisation process which had been used during manufacture. This pressure treated process means that the preservative is drawn deep into the fibres of the wood itself, giving it long lasting protection. It’s because of this that the manufacturers have felt confident enough to offer a 15 year anti-rot guarantee. 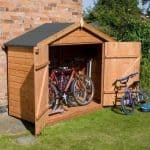 The best thing about this guarantee is that it isn’t reliant upon the owner having to retreat the shed on an annual or bi-annual cycle, saving them time and money. We had to duck down a little when entering through the single, hinged door but once inside we could stand up straight thanks to the rise of the apex roof. The door comes complete with a hasp and staple, but the latch itself could be a little stronger. That’s why we would recommend the addition of a stronger latch and a padlock. 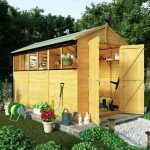 There are no windows in this shed, a design feature to add extra security, so you’ll need to bring a torch or have one positioned conveniently within the shed. 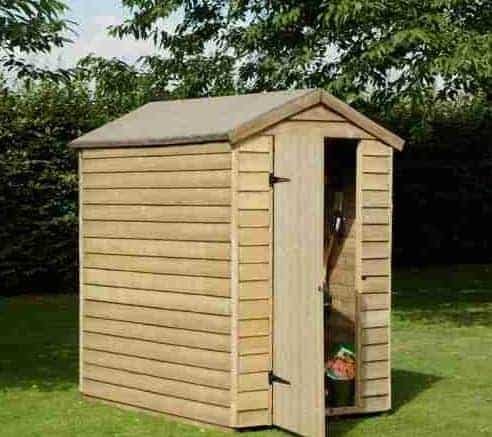 Whilst we did note concerns over the latch, this can easily be rectified, and with the addition of a strong padlock this shed can become a safe place to store the garden equipment that you’ve worked hard to purchase. That’s largely because of the windowless design. If your shed is in an exposed area, then lots of people will pass by it every day. With this shed, however, they will have no way of knowing what’s inside. Because of this, there is much less chance of your shed being targeted by opportune thieves. There are several optional extras available for this shed, and there are two in particular that we would recommend. The first is the addition of an extra padlock or security system. One excellent option in this area is the Yale security kit. Yale is a name that’s synonymous with home and shed security, and this kit includes everything you need, with a padlock, hasp, and audible alarm. We would also recommend that you invest in the base kit. You’ll have to construct it yourself, but this is quickly and easily achieved. 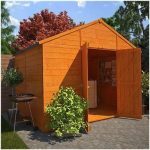 Once in place not only does it offer a firm and level base and support for the shed itself, it prevents the shed coming into direct contact with the soil. This itself helps to add extra longevity to the shed, making it even better value. Solar lighting can also be added which is a practical and yet attractive addition, and is perfectly in keeping with the environmentally friendly credentials of this shed. We were pleased to find that this shed was made from European timbers that come from certified sustainable sources, so it can help keep your carbon footprint under control. From looking at the shed we could tell that it was going to be a high quality garden structure, and we weren't disappointed. The 15 year manufacturer's warranty against rot shows just how long lasting the materials are. With solid sheet flooring and roofing, and overlap cladding, moisture is kept outside where it belongs. The apex roof really helps to increase the storage space, and it was one of those sheds that seemed bigger on the inside than the outside. If you want a little extra storage capacity, garden shed hooks can be purchased as an optional extra. Two people are required to install this shed, and yet we found that it fitted together very quickly and easily. Two hours was more than enough time to have it fully constructed and ready to use, and the instructions included with the shed were straight forward and simple to follow. 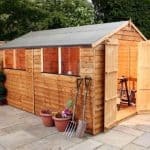 This security shed costs less than many garden tools that could be stored inside it, and with a long guarantee included with it, it really does offer very good value for money, even if the additional base and security kits are purchased. Final Thoughts: Once constructed, we decided to see whether this shed would be as tough as it looks, and we are pleased to say that the 8mm cladding and solid flooring gave us confidence in its strength and durability. With its windowless design, you won't want to spend too much time in there, but this can be a vital safety feature when it comes to stopping the rising threat of shed crime. This is an ideal proposition if you want a secure storage place that you can construct and then forget about. With no annual treatment required, you can save considerable money when taken over the full 15 year period, although we would recommend painting or staining the shed both for aesthetic reasons and to protect the timbers from becoming faded by the sun.